As the target of Lefteris Bochoridis is becoming ever more elusive for Panathinaikos it seems they have set their sights on another prospect that's far easier to sign. Antonis Koniaris(1.90-PG/SG) is the next target according to Paok affiliated newspaper Sports of the North. 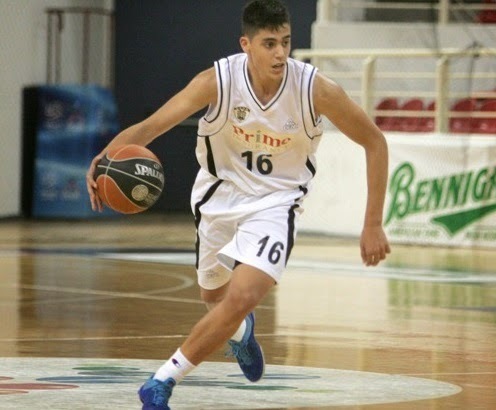 Koniaris(30/09/1997) is currently 17 years old and is one of the best prospects in the ranks of Paok AC(the non-pro division). Once the player reaches the age of 18 he will be able to sign a contract with whichever team he wishes. His agent Tasos Delimpaltadakis made the same statement to that newspaper saying that Paok could as well lose the player without receiving a single cent. It's rumored that Paok might receive an amount of the order of 50-60,000 euros for the players trasfer to Panathinaikos BC. You may ask what stops the player from signing somewhere else when he reaches 18? Well, the combination of Panathinaikos's contract and the player's agent make a pretty convincing argument. Unlike Bochoridis who signed a pro contract after he became 18, Koniaris is not bound by a pro contract making him fair game to any team. Koniaris is a member of the Greek Youth National Teams and currently preparing with the U18 National Team. What might make things even more interesting though is if suddently Olympiacos jumps into the mix!